One entry in the "Elevating Erie" contest added in green space, pedestrian and bike paths, and more spaces for commerce around the area. A jury of local and national experts reviewed the submissions and awarded winners based on the project sites of BLVD, BLOCK, BRANCH, and BRIDGE. WAER's Chris Bolt reports how cutting edge ideas to transform parts of Syracuse and Dewitt could spark change. Architect and planner Jeff Olson of the design firm ALTA was a judge at the competition. He started out by thanking the entrants, who collectively came from 16 different countries. “We don’t get enough chances to do this, to have imagination - be a leader in our communities and to help look at that 50 year future supervisors said we’re building,” Olson said. 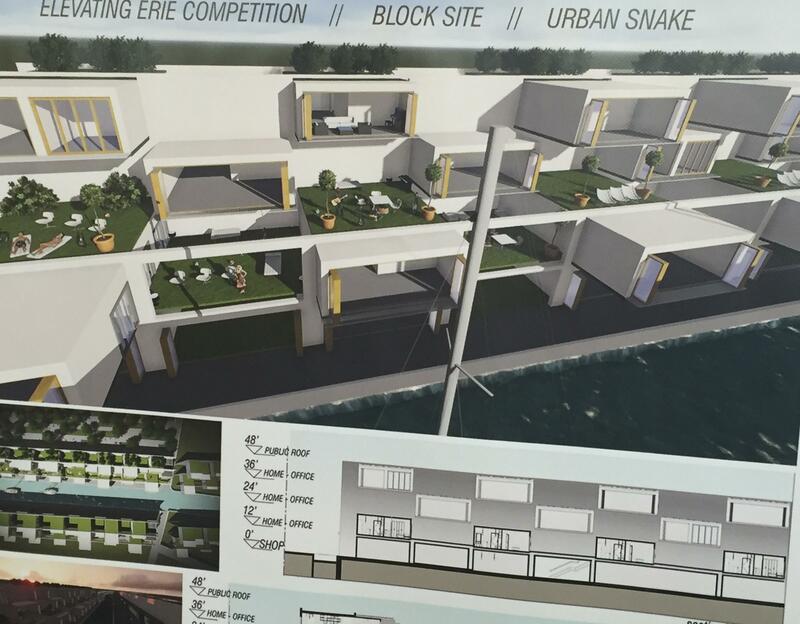 This entry depicts luxury apartments behind Erie Boulevard and the re-opening of the canal, which would allow sailboats to drift down the water. The competition was opened in the Fall of 2015 by the City of Syracuse and Town of DeWitt. And the designs are certainly futuristic. 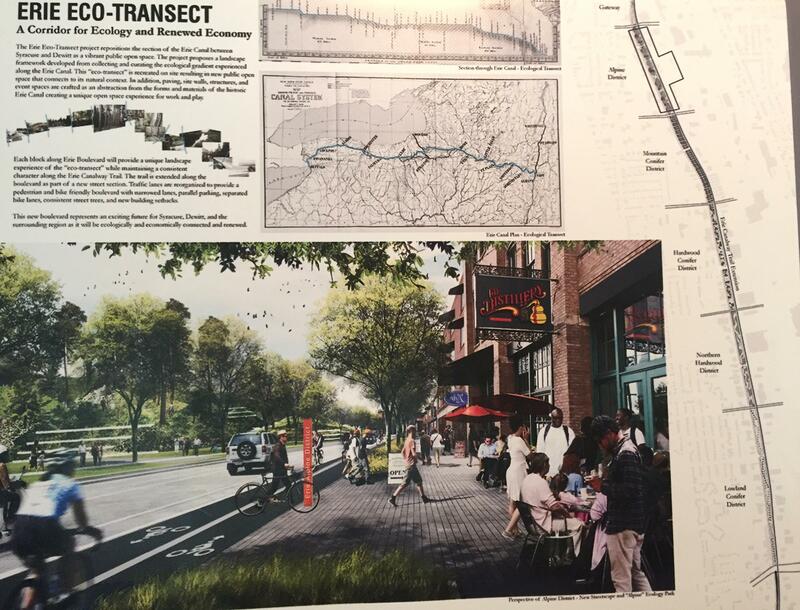 Some envision a new plan for Erie Boulevard with park-like, bike, pedestrian and alternative transportation corridors. Others re-cast the wetlands near Bridge Street as a park, wildlife area, or waterfront for businesses and restaurants. 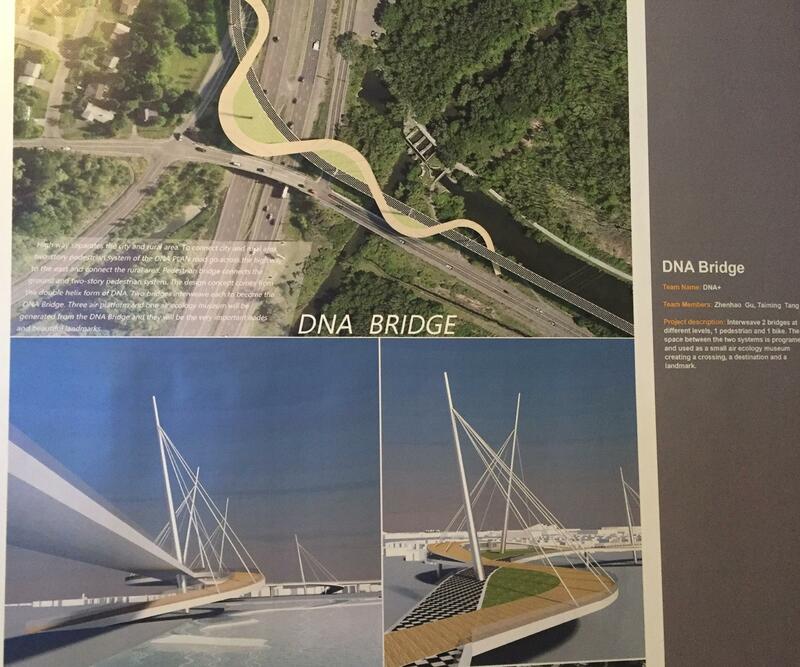 Another imagines a DNA-shaped bridge for walkers and bicyclists that would connect the Erie Canal in Dewitt across Route 481. Some of the ideas focused on closing a gap in the Cycle the Erie Canal trail through Syracuse. Landscape Architect Chris Reed of the design firm Stoss said many designs utilize, in some way, the old Erie Canal; the original plan is just re-imagined. Dewitt Town Supervisor Ed Michaelenko says many of the ideas contained in the designs match up with goals of town development. Of course investment, and who would do it, are the big questions - especially given costs of some of the more imaginative designs. But planner Jeff Olson said a turning tide of investment in urban areas. This entry shows the use of a two-level, bike and pedestrian DNA-shaped bridge that would wind around Route 481 to connect Syracuse and Dewitt. All submissions are on display at the Erie Canal Museum and online. The right design and enough proponents could be coming along at the right time. The Upstate Revitalization Initiative recently awarded the area $500 million for development of projects related to city infrastructure. The Elevating Erie Designs can be viewed at the Erie Canal Museum through August 14. The entries are also available online, where the public is encouraged to give feedback on ideas that were submitted. This online survey is also designed to gage community priorities for the corridor. Central New York’s Regional Economic Development Council continued its winning ways this year, walking away from Gov. Andrew Cuomo’s Upstate Revitalization Initiative (URI) and Regional Economic Development Council (REDC) Awards with a total of $500 million. The region will receive the money over the course of five years in roughly $100 million increments. Thousands attended the 47th annual DeWitt Canal Day over the weekend trying to raise more awareness about the recreation and other advantages the area has for the region. Event supervisor Christine Manchester says the trail system along the canal does draw significant attention.